Doug Parker and Alan Joyce in an American 777-300ER. American Airlines will replace a portion of Qantas’s flights between Los Angeles and Australia from December, freeing up an aircraft for the Flying Kangaroo to resume services to San Francisco. 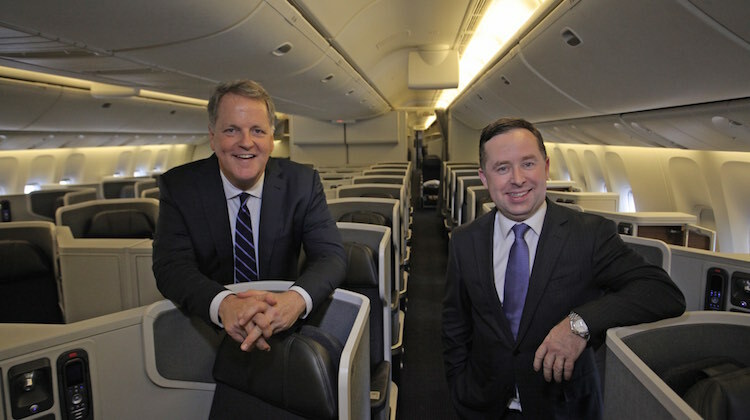 Qantas chief executive Alan Joyce and American chief executive Doug Parker announced the new routes on the sidelines of the International Air Transport Association annual general meeting in Miami on Tuesday. American will operate the Sydney-Los Angeles route from December 17 with a daily service operated by three-class Boeing 777-300ER aircraft. The airline last served Australia with its own aircraft in the early 1990s, when it briefly operated a four times weekly LAX-Honolulu-Sydney service using Douglas DC-10 trijets. Meanwhile, Qantas is returning to San Francisco from December 20 with three-class Boeing 747-400s, bringing back a destination dropped from its network in 2011 when it began services to Dallas-Fort Worth. The flights would initially operate on peak days and increase to six times a week from January 2016. A table detailing the two airlines’ new joint services, see below, also reveals that Qantas is dropping one of its currently three times weekly Melbourne-LAX 747 QF95/96 services, as well as four of the current seven times weekly QF17/18 Sydney-LAX 747 flights. Qantas introduced the additional evening QF95/96 MEL-LAX services as a permanent part of its schedule in January this year. Under the new agreement it will continue to operate daily A380 services from Sydney and Melbourne to LA. Overall the new services and schedule changes will see a net nine per cent increase in capacity offered by the two airlines between Australia and the USA, with a six per cent net increase on the Sydney-LAX route. “San Francisco is now the most popular onward destination for Qantas’s customers travelling to the US and we’re thrilled to be going back. We know there is a strong demand for direct flights, particularly from our corporate clients who will save about four hours each way by not having to connect through LAX,” Joyce said in a statement. The new arrangements will also see the two airlines move to a “revenue share” agreement covering codesharing on each other’s Australia-US flights. So Qantas retires most of its 747’s, then they have to sacrifice services to LAX to free up one aircraft when they want to resume services to SFO? It’s interesting that when QANTAS dropped San Francisco for Dallas the only direct flights from Melbourne were those provided by Air New Zealand using B-777’s. I have traveled ANZ a number of times to San Francisco & QANTAS will have to provide an above average service just to compete with them.I don’t think the B-747-400 is the way to go. Great to see Qantas increasing its “oversea’s” flights, and for so long SFO has always been part of their network. I guess there is no hope of Qantas going back to Australia – Hawaii – USA Westcoast flights. Nice to see this far, Australia to SFO. Keep up the good work Qantas. Good to see Qantas management still gifting away prime routes to competitors. So some flights get the 777 – The AA configuration of that plane (10 across) makes a sardine can look positively roomy. Enjoy the big squeeze for those who travel on it – absolutely cruel to travel on. MEL-SFO is just too far westbound to work. Is this the only way QF will use a 777? Wake up guys, you are the ONLY company operating a quad trains-Pacific now! If SFO is as popular for Qantas onward connections as they say, is there the potential to deploy the A380 there instead..? @steve. What a stupid comment. They are still flying the LA routes but at a reduced additional frequency which is being picked up by AA on a shared revenue basis plus QF now returning to KSFO. I would have thought that this is a win for passengers. Considering the additional MEL-LAX flights consisted of 3 flights per week and the SYD-LAX flights were 7 now reduced to 2 and 3 per week suggests they were not that profitable if at all. Perhaps with a lower cost base that AA may bring means that on a revenue share basis, the additional flights may be profitable. Beleive it or not, significant lifeform does exist outside Victoria. Does nkt look like the travelling public agree with qantas . Maybe that it is the problem with qantas.. they r out of touch.. for a company in a customer service industry they dont listen to their customers.. They will probzbly just employ another embassador for trend or uniform or something useless..
while im writing this why not include that qantas executives think they r genius in increasing profitability .. but then if u dont pass on the reduction in fuel costs to your customers of cause profit will increase..then will those same executives get a bonus for the profit increase.. is that why they r not reducing the fuel surcharge.. Giving away market share on the syd lax route is madness..
Good move QF , SFO here I come. I wonder if AA was planning to start flying to Sydney in any event, like they have recently re-entered Hong Kong and Seoul. They seem to be on a bit of an expansion push to the west at the moment. With the $AUD falling against the $US it makes sense for more americans to want to come to Australia. But to Qantas’ credit theyve made it into a win-win for both airlines and have been able to re-enter SFO as a result. I guess they treat the US as a whole market, and potentially a small loss of market share (or $$) to LAX is related to a big win with SFO. Really good to see QF going back to SFO, a beautiful city in its own right & a good connecting hub for key cities like Seattle & Portland as well as Toronto, Vancouver & Montreal. I just hope the frequency moves to SFO moves to daily as I do with Dallas as there is nothing like “daily” to win market share! If Qantas was smart they would buy new 747-8Is to replace their 747-400/ER. Qantas could seat over 400 people in a 4 class configuration on a 747-8 that’s over 47 additional seats using the current Qantas seats. The 747-8 can fly further, with more people while costing less to operate and also use existing airport infrastructure. Boeing want to sell more 747-8s so Qantas would get a deal of the century. Also Qantas should look into launching Jetsar USA or Jetstar North America using Boeing 737-800/900ER NG/MAX along with Boeing 787-8/9 and code share with them.